A little while back, I had a craving to check out a pho place near my house - which unfortunately closed down! 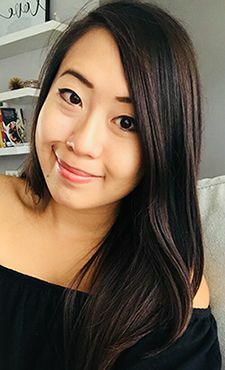 I quickly chose another option and headed out to the West end of the city to discover what type of restaurant claimed to have fine Vietnamese cuisine. On our way to the restaurant, it started to rain! In the middle of winter.. thanks to Global Warming. But when we arrived, we were relieved to find a relatively large parking lot, with most spots located close to the restaurant entrance. My friends and I ran from the car, slipping and sliding our way to the front door. The interior of the restaurant is bright and clean, with most of the decor being brown or black. Nothing out of the ordinary, but a nice, modern environment to dine in. After being seated, we were greeted with a menu featuring many items. From soup noodles, to rice, to salad, there was plenty of variety and lots to choose from. What stood out to me though, was the lack in the number of available pho options - there were five to be exact, and all of which were apparently featuring a dish from a different region of Vietnam. 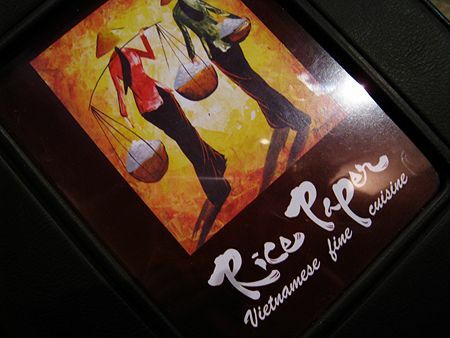 To start off our night, we ordered a dish recommended to us by the server - the Rice Paper Special. The dish was basically a do it yourself (DIY) salad roll, featuring different grilled meats. 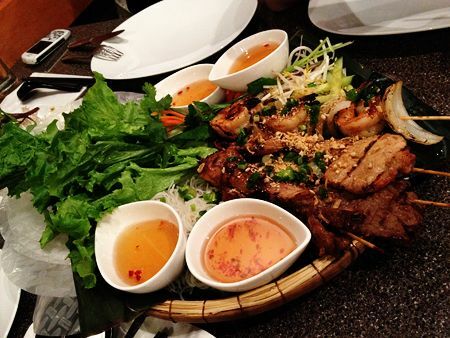 The ingredients were served up on a bamboo woven dish, and contained grilled chicken, pork, beef, and shrimp along with green onions, grilled onion, carrots, cucumbers, bean sprouts, vermicelli and lettuce leaves. We were also provided with six sheets of rice paper, fish sauce, and a plate of water to dip the sheets in to soften them up. Now, don't get me wrong. The salad rolls we made for ourselves were delicious. The only problem is that I would much rather have had the rolls pre-made for me. The table was small and cluttered with cups, cutlery and plates, and the whole process of making and eating the salad rolls was so messy that I was frustrated. I've made these rolls many times before in my kitchen, and have never had any problems, but to sit down and make them, and eat them right away is downright difficult considering the amount of space you have to do so. While we were still constructing and eating the rolls, our entrees arrived, making it a gong show to try to fit everything on the table without having it spill or fall off in the process. If the kitchen had timed things right, it may have been better. After having our large platter removed from the table, it was much more comfortable for us to continue on with the meal. Since the entrees arrived at our table quite early, most of our food had reasonably cooled down. 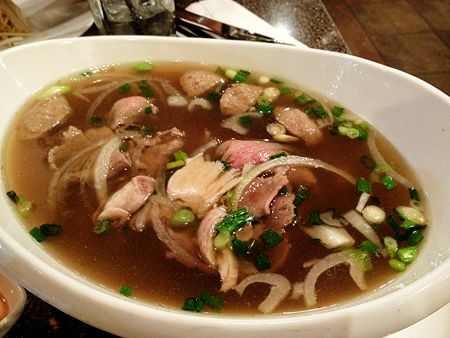 I ordered the Northern Vietnamese Soup - probably the item I would be most familiar with, but I found it odd for the restaurant to mix chicken & beef together. The soup base in this dish was excellent - reminded me of my favourite at Basil Leaf. The chicken was tender and delicious, and the beef balls had a nice elasticity in each bite, but the beef was a different story. I found my beef to be tough and hard to eat, so I left it untouched. My other friends ordered the Central and Southern Vietnamese Soups, which they said were pretty good. The portions at this particular restaurant are quite generous, and enough to fill you up. Presentation of the food is great as well, and I quite liked the way the Rice Paper Special was brought out to the table. However, one thing to consider would be the factor of price. 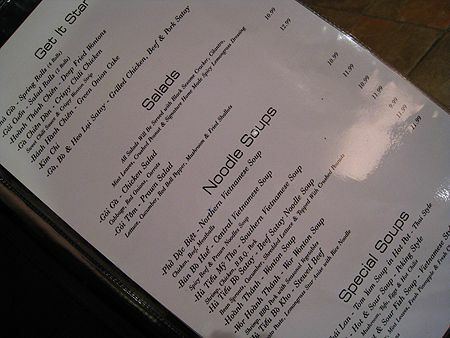 The noodle soups themselves are priced from $9.99 to $11.99, which is considerably more expensive than many of the Vietnamese restaurants in the city (I would say a typical bowl of pho is about $7.50 - $8.00 right now..). Perhaps it is attributed to the idea that they are a fine cuisine restaurant..
too bad the beef was tough to eat.. The food looks delicious, especially the rice rolls, but it must have been annoying to roll them :( Makes me wanna eat pho again soon! That looks soooooo good! Im hungry!!! 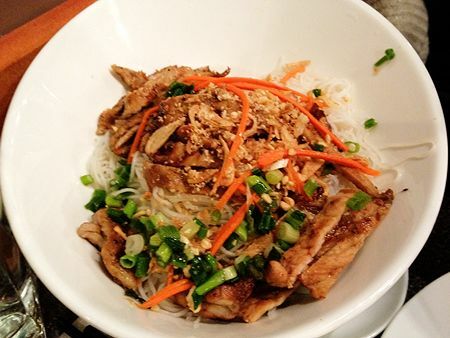 oh that vermicelli with grilled chicken is heaven to my eyes.